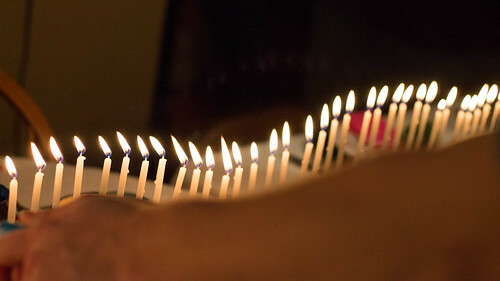 My dad made this sweet candleholder that held 93 white tall birthday candles. 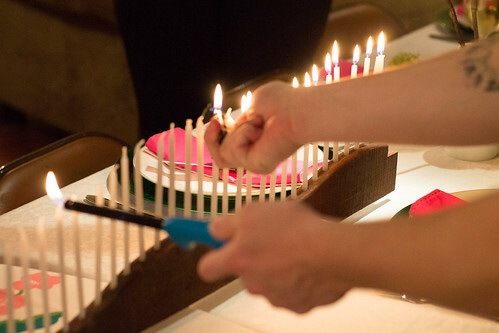 It was inspired by this 10 foot long birthday candelabra on A Subtle Revelry. 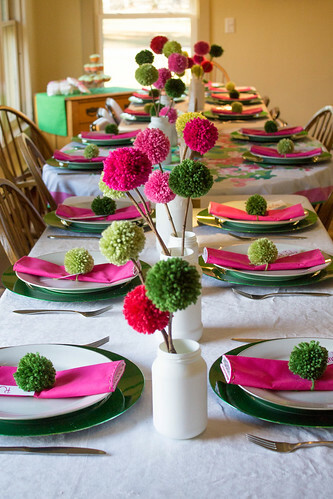 We set the table (three tables!) for 16 people! 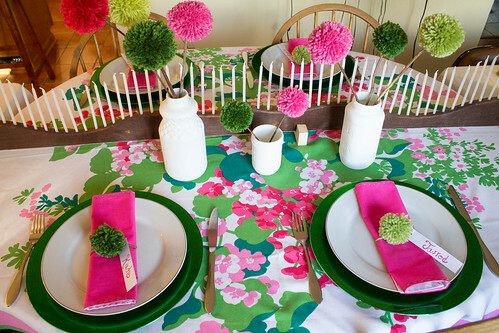 In the photo above, you can see the vintage tablecloth that I bought from Etsy (from the shop Redicovered Retro). When I saw it on Etsy I just HAD to have it, even though it wasn't big enough for our entire table. So we decided to use it on the middle table with the tables on each side sporting white tablecloths. My mom also helped with these fabulous little dinner napkins which were inspired by this Running Stitch Napkins tutorial from The Purl Bee! She sewed pink and white fabric squares together, turned them right-side out through a little opening, and I hand sewed a running stitch in green pearl cotton around the edges. 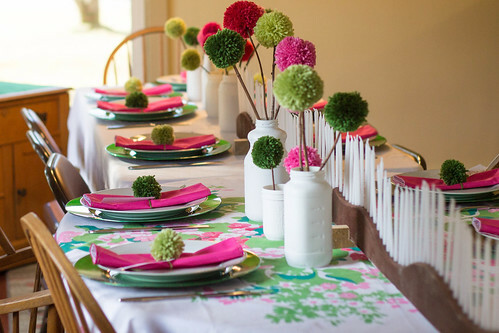 I love how they turned out, and will keep this tutorial in mind... they'd make a great gift! 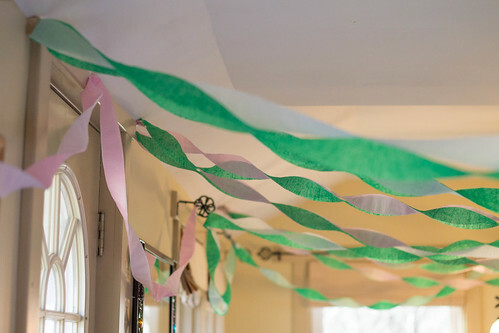 I also bought green, pink and white streamers with the hopes of making Fringe Layered Garlands... but time became an issue. So Gin and I just had to put them up as is, which probably proved more difficult than it would have been to make the fringe layered garlands... We decided streamer hanging was definitely not our forte. It's been far too long since our prom days! My sister also made these lovely cupcakes! 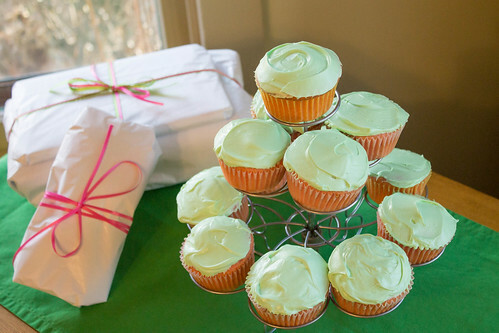 Using a strawberry cake mix and some green food coloring in the frosting, you can't say we don't know how to run with a theme! I'm happy to report that our 8 foot long candelabra did not start a fire... With lots of pom poms and crepe paper around, we took precautions and had a fire extinguisher at the ready! Once lit it looked so pretty! (And threw off a good amount of heat!) Don't worry, we didn't make Gram blow out all 93 candles herself! She had lots of help! Hope you all have a great weekend my friends! 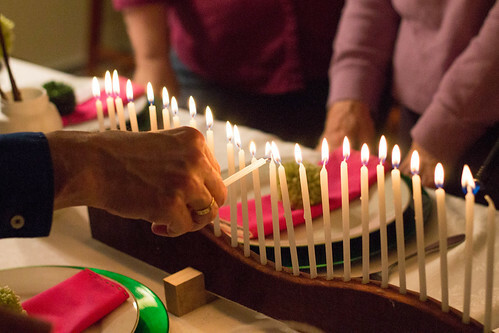 What a simply wonderful 93rd birthday party for your Gram! 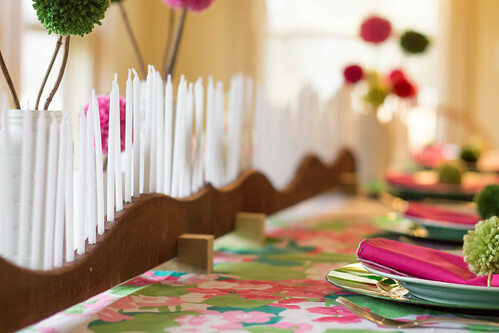 That candle holder is a marvellous idea and looks wonderful. I love the wavy design. 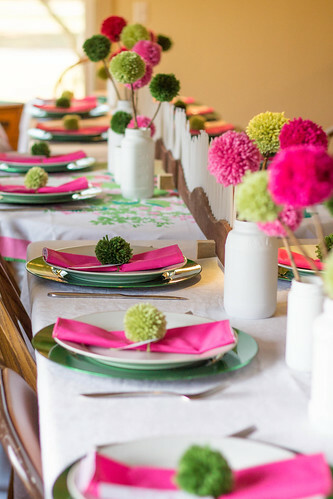 The pink, green and white cloth is so fresh looking and the bright pink napkins look perfect! I really like that green running stitch running along the edge. 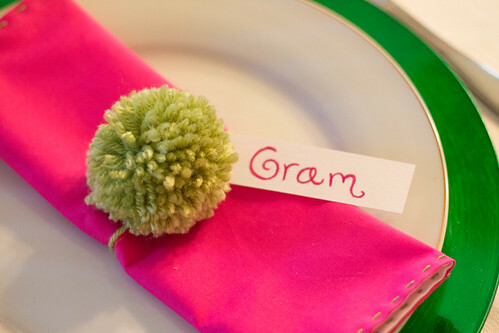 Fun to have a pompom napkin ring too. You certainly did everything to make your Gram's birthday the best ever! Well done! 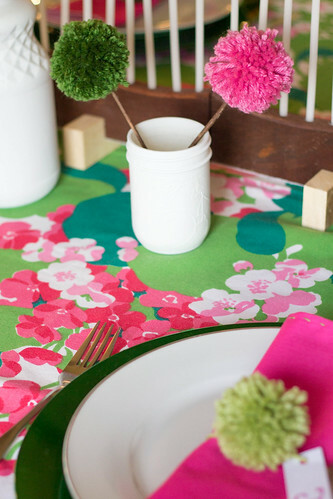 A pom pom wreath would be a lovely reminder of the day and uses lots and lots of pom poms. If I didn't know better I'd say that she is one lucky Gram to have you - but I happen to know that you are all just as lucky to have her!